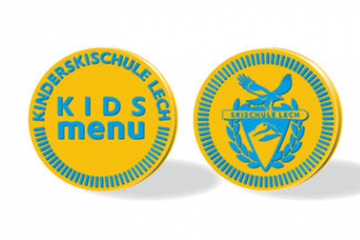 Here at Lech Ski School we have a special place in our hearts for our youngest skiers. In our exclusive Kinderland children aged from 4½ are cared for in a safe and entertaining environment where they will develop a desire to ski and enjoy the snow. Special learning aids and children’s programmes help mini-skiers and newbies to learn to ski here. Advanced children will conquer the pistes of the Arlberg with our carefully chosen children’s instructors. Learning the rules of proper piste etiquette while perfecting their technique along the way. Children’s natural enjoyment of snow, speed and movement makes winter sports the ideal hobby. At Lech Ski School we will do everything in our power to ensure that skiing becomes an experience your child will treasure forever. Children learn best in groups where they can motivate each other. Under our motto, “Teamwork makes it easier” the kids will join forces and learn together. There is no question that skiing and playing in the snow is far more fun in a group! This is why our instructors take the best care of our youngest skiers from Sunday through till Friday from 10 a.m. till 3 p.m. We offer our lunch tokens to ensure a stress free and fun lunch together with the whole group. In our group courses individual attention is payed to each child's abilities. Playful techniques and programmes designed specifically for children ensure rapid progress. The top priority is always having fun together and staying safe, while along the way forming great friendships! Please speak to one of the instructors at the meeting point regarding group allocation. The BLUE, RED and YELLOW flags in the centre of the meeting point can serve as a general guide. In each section several instructors for each ability level (see Ability Based Groups) will be waiting. They will be able to place the children in the most suitable groups based on answers to questions about skiing ability and the number of “weeks skiing”. Reassignment is possible at any time during the first day of skiing after the completion of the first technical exercises. Group allocation takes place at the meeting point from 9.20 to 9.45 a.m. Please note the new meeting point next to the Oberlech Gondola, along the river in the village centre. Sunday – Friday, minimum of 4 hours per day. Advanced learners can start on any day (except Saturday). Courses for beginners start on Sundays and Mondays. All children require a valid ski pass! Lunch is eaten with their ski instructor during the lunch break (not included in course price). Refunds for unused days can be issued only in the case of an accident or illness upon presentation of a medical certificate from a local doctor. Personalised support and undivided attention are particularly important in ensuring children can fully enjoy the snow. Parents also appreciate the certainty that their child is receiving the best possible care and learning environment with the highest degree of safety. In the private lesson format our instructors can tailor their instruction to precisely your child’s needs and abilities. The personal attention of a private lesson guarantees your child a safe and carefree skiing experience, whether they wish to enjoy this attention alone, with siblings or even with friends! For snow bunnies and future racers! There is something magical in the air at the exclusive Kinderland at Lech Ski School. An enchanted forest, magic carpets that move by themselves and wave tracks and jumps conjured up by fairies. Fun, speed and adventure are on the agenda here for children aged 4 ½ to 13. You don’t need a magic wand to enjoy the full package of fun in Kinderland at Lech Ski School! Children learning to ski here feel like real racers. Beginners are introduced to the snow and skiing in a playful atmosphere. While “pros” can practice slalom or freestyle skiing with speed and passion in our Funpark. Younger skiers are supervised by our Kids’ Club. The magic words at Kinderland are quite simple: fun, fun and more FUN! Racing like the top skiers: The exciting atmosphere of a race takes shape every Thursday or Friday as the groups from the Kid’s Ski School get ready to race. Everyone gets the opportunity to show what they can do and what they have learned during the week. Everyone has reason to celebrate at the awards ceremony at the children’s meeting point as we believe every child is a champion and receives a medal.